In honor of America Recycles Day, Keep Scottsdale Beautiful (KSB) will host I Recycle Scottsdale, a one-stop recycling event aimed at ridding Scottsdale homes and businesses of unwanted, harder-to-recycle items, including electronics, shoes, and prescription drugs. 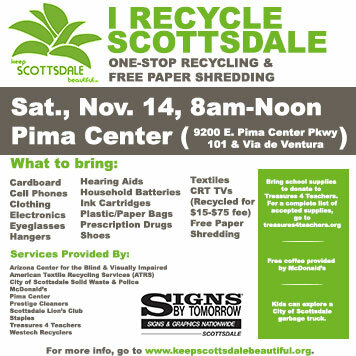 Prestige Cleaners is proud to participate in the I Recycle Scottsdale event which takes place Sat., Nov. 14 from 8 a.m. to noon at the Pima Center Business Park, located at 9200 E. Pima Center Parkway. Services will be provided by Arizona Center for the Blind, American Textile Recycling Service, City of Scottsdale Solid Waste and Police Departments, Prestige Cleaners, Scottsdale Lion’s Club, Staples, and Westech Recyclers. How Prestige Cleaners Can Save You Valuable Time and Money Do you have what it takes to sing Prestige Cleaner’s 12 Stains of Christmas? Give us your best rendition and qualify to win a $500 Prestige Cleaners Gift card!